A restored Elizabethan mansion - once King Charles I's headquarters during the English Civil War - has opened to the public for the first time. The Grade I listed building near Newbury was built for a cloth merchant in 1581 and boasts a royal suite constructed for Queen Anne. It houses the West Berkshire register office and is used for special events. Restoration work began in 2005 after the mansion was awarded more than £4m from the Heritage Lottery Fund. Berkshire-based Vodafone and English Heritage also contributed to the £6m project. In 1644, the king made Shaw House his headquarters during the second Battle of Newbury. 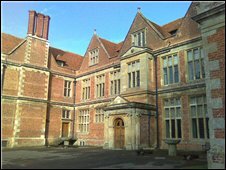 The public opening of the manor coincides with the date when he was fired at by an opportunistic Parliamentarian soldier. 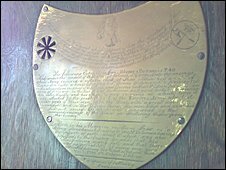 The bullet narrowly missed the king but entered the wooden panelling in his bedchamber on 27 October 1644. The hole it left has been marked by a brass plaque. During the restoration the house was repaired using original material and unsympathetic modern decorations were removed. An Elizabethan bakehouse was discovered beneath the floor of the kitchen. Pamela Bale, executive councillor for leisure and culture at West Berkshire Council, said: "It's excellent to see the care and attention to detail that has gone into the restoration of Shaw House." Michelle Davies, regional head of the Heritage Lottery Fund, said: "Shaw House is a real jewel in the south east's cultural crown. "Its Tudor architecture makes it a beautiful place to visit and its walls have witnessed many exciting moments in history. "We are proud to see it restored to its former glory, ready to welcome visitors and to inspire new generations to step back in time."